Weighs less than a standard Aluminum unit. Ideal for situations where portability and mobility are a concern. See the specifications below and compare. 1/4-20 tapped holes or M6 tapped holes. Plastic or Nylon screws recommended. 1/4-20 or M6 metal inserts added for repeated usage of holes with most types of screws. 0" 12" 18" 24" 30" 36" 42" 48" 60" 66" 72" 0" 12" 18" 24" 30" 36" 42" 48" 54" 60" 66" 72" 78" 84" 90" 96" 102" 108" 114" 120" 144" Ultra Light Weight (no inserts) Ultra Light Weight w/ Inserts Ult Light Weight (no inserts) - Cleanroom Ult. 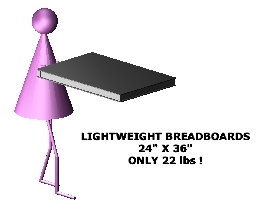 Light Weight - Cleanroom .5" 1" 2" (Most economical) 4" 8" 10" 12"